Telescope positioned in the driveway? Check. Camera charged and lens changed? Check. Wagon full of filters, extension cords and PowerTank? Check. Drink poured? Check. And…no moon. Where are you, moon? I doublechecked her position with StarChart and—after arguing with a neighbor who said he just saw it out his window and it’s rising in this direction not that direction—I concurred and moved the whole awkward shootin’ match to the back yard. Still no moon. After much hiking around our tree-lined property we finally glimpsed the dim, fully eclipsed moon, almost completely obscured by the tall pines to the northeast. Crap. What’s that old adage I just made up? “The worst night for astronomy can turn into the best night for drinking.” The evening was mild, the rest of the universe was on glorious display, and the moon finally rose between two trees shortly after totality, letting us enjoy a few minutes with the telescope. I barely had time to try a lunar sketch. Guess what? 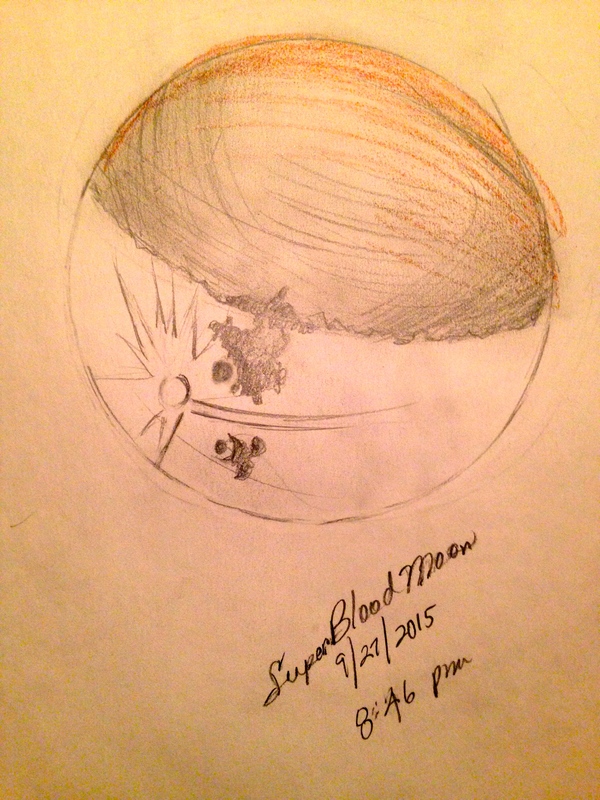 Drawing a supermoon is not super easy. I wasn’t using the scope drive so the damn image kept MOVING out of the viewfinder, and juggling the red flashlight on my iPhone, my eyeglasses, three drawing tools and a pad was like a Mr. Bean episode. Well, I have eighteen years to practice.